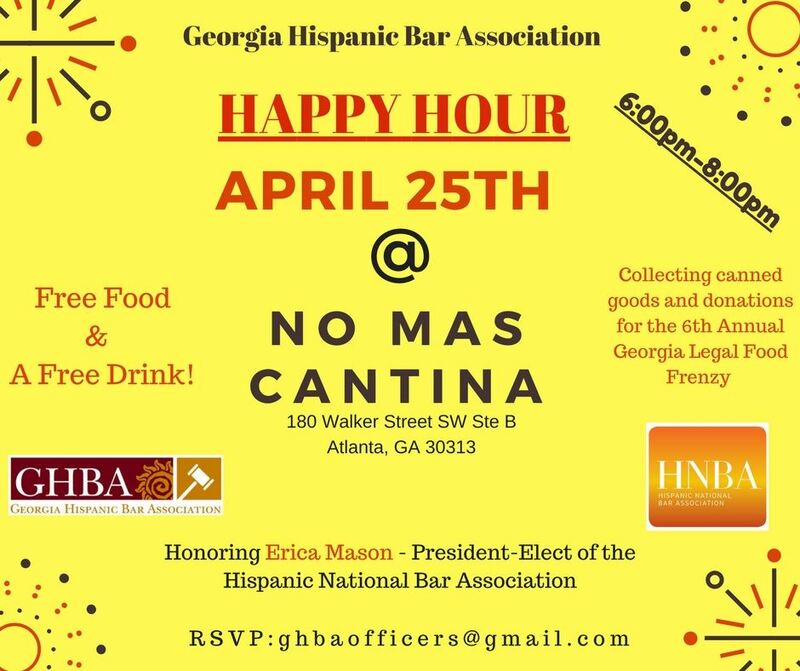 On Tuesday, April 25th we're planning on honoring Erica Mason for her service in the role of President-Elect of the Hispanic National Bar Association - and for bringing Atlanta to the national spotlight. Join us at No Mas Cantina, located at 180 Walker St SW, from 6pm to 8pmfor free food, a free drink, and an inevitably good time! R.S.V.P. by emailinng GHBAofficers@gmail.com or clicking here. Also, as part of #GHBAGivesBack, we will be collecting canned goods and donations at this happy hour for Atlanta Community Food Bank as part of the 6th Annual Georgia Legal Food Frenzy. Remember: $1 = 4 pounds. 1 pound = 1 pound. Money is gold in this competition! Let's help GHBA win this year!